I talk a lot around here about getting unstuck from a life that feels routine and unfulfilling. It’s a topic that hits home for me, having felt this way in the past and always being in the process of reinventing myself. But, I know it’s a state that many people can relate to because for many, by the time they get into the groove of life, they realize they’ve spent many years creating the wrong life, and they don’t know what to do about it. Recently, while reading Work Reimagined - Uncover Your Calling by Richard Leider, I came across a phrase that stuck with me: If you can’t get out of it - get into it. So what exactly does that mean?? It means, that instead of giving into the situation and leaning on those comfortable, worn-in phrases of “I can’t…” or “I don’t have a choice…” or “It’s not fair…”, it’s choosing to dig in, get into it (even if you don’t like it), and power through to the other side. If you can’t get out of it - get into it! There’s always another side to every situation, but when we’re in a place that we can’t easily get out of, we have to get into it, in order to get to that other side. Otherwise, we just stay stuck. By getting into it, we make a choice and own the process. Just by making that choice, we remove some of the ‘stickiness’ that keeps us stuck, because when we feel we have no available options, it inevitably leads to resentment, frustration, and helplessness. But, when we choose to embrace whatever situation we find ourselves locked into and dig into it instead of resisting or avoiding it, we choose to do things differently. Maybe it’s our actions, or perhaps it’s our mindset, but making that choice puts us back in the driver’s seat and gives us the ability to keep moving forward instead of staying in one place. Let’s talk a little bit about feeling stuck. There are many ways in which we can feel stuck: a project at work that’s dragging on that we don’t love; a career that isn’t using our talents and is going nowhere; a relationship that has passed its prime but keeps lingering on; a house that’s become a money pit, but we can’t sell it and move right now. We all want to feel we’re using our time well and we’re living a meaningful life, yet when we’re feeling stuck in life, usually that ‘meaningful’ or ‘fulfilling’ piece is missing. There’s a gap between what we’re doing or how we’re spending our time, and what or how we want to be spending our time. Furthermore, within that gap, there’s typically a disconnect between our values and our actions. “Getting into it” is how we get ourselves out of what’s not working in our life when we see no other options for escape. So, how do we “get into it”? Make compromises - What expectations aren’t being met vs. the reality? We must ask ourselves: How can I modify those expectations to be more realistic? Explore our gifts - We have to think outside of our typical routine. We have to get really clear on what we’re really good at and what we enjoy doing. With that insight, compare that to the current situation. Where can the two come together? How can we sprinkle in our unique gifts with our current undesirable situation? Be grateful - As unpleasant as things may be right now, there are always things to be grateful for. Maybe we hate our job? We can be grateful that it’s keeping the roof soundly over our heads. Stuck in a dead-end relationship? Thankfully, it’s teaching us what doesn’t work so when we find our way out of this situation; we’ll approach things differently (either with the same person or a new person). Approach the routine from a new perspective - How can we look at the current situation differently? What are some benefits we can see from the situation that has previously gone unnoticed? Be curious - This is my favorite tactic for pretty much anything! If we can find one thing that makes us curious about our current situation, we can chase it and follow it to a discovery (either about ourselves, a new path, etc.). We have a choice in how we live each day - float along at the mercy of our dissatisfaction and challenges, or embrace them and look for ways to turn them into advantages and opportunities. There are always two sides to every situation, so we get to choose how we want to view it and react to it. We can stick with the known path that’s making us miserable because it’s familiar, or we can make a choice and own it as a means to get into it and, ultimately, to get through it. If you’re feeling stuck in life, I challenge you to get into it, to get out of it. JOIN MY EMAIL COMMUNITY TO GET UNSTUCK! Feeling stuck in a rut and ready to get out of it? I’ve put together a PDF with 50 ways to bust out of your rut! I call them Rut Busters! My email community gets extra perks of workbooks and PDFs to help them on their journey to finding their purpose and creating the life they crave. 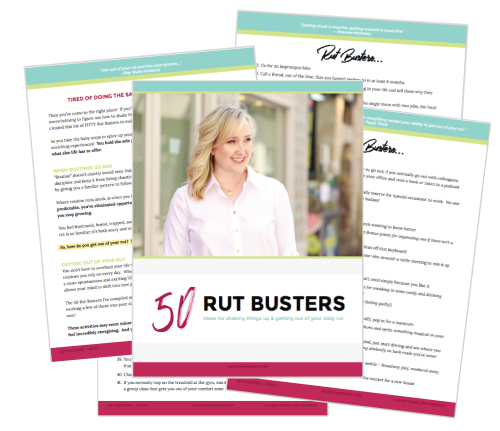 If you’d like to get your hands on these Rut Busters, join my email community! In addition to this handy-dandy guide, you’ll get weekly inspiration to follow your heart, dig deep, and reinvent your life. Along the way, you’ll get bonus PDFs, workbooks, audio recordings, etc. that aren’t available to those who haven’t raised their hand to join my email community! Once you sign up, I'll send you an email with a link to the Rut Busters PDF as a Thank You for joining my community! Going forward, you will receive weekly emails from me, but only me. I protect your email as if it were my own and NEVER share it with anyone!